Is Catholicism a cult? Do Catholics worship Mary? Why do Catholics have statues in their churches? The truth may surprise you! Highly recommended by priests and catechists, "Catholicism for Protestants" is a Biblical explanation of Roman Catholicism as told by Shane Schaetzel (FullyChristian.Com) -- an Evangelical convert to the Catholic Church through Anglicanism. The book is concise and formatted in an easy-to-read Question & Answer catechism style. It addresses many of the common questions Evangelical Protestants have about Catholicism. 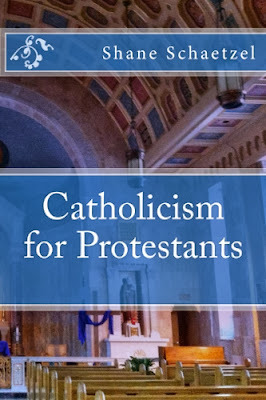 It is ideal for Protestants seeking more knowledge about the Catholic Church, and for Catholics seeking a quick refresher course on fundamental Catholic teaching. It's an excellent book for Catholics and Protestants alike! The book contains a NIHIL OBSTAT from Reverend Allan Saunders, Censor Librorum, and an IMPRIMATUR from the Most Reverend James V. Johnston, Jr., Bishop of Springfield-Cape Girardeau. Foreword by The Rev. Christopher Phillips, Pastor of Our Lady of the Atonement Catholic Church in San Antonio, Texas. Shane Schaetzel is an Evangelical convert to the Catholic Church through Anglicanism. He lives in Southern Missouri with his wife and children. He works in the medical field as a respiratory therapist. During the 1990s he studied for the ministry in an Evangelical Church in Springfield Missouri, before he converted to Anglicanism and then finally to Catholicism in 2000. Shane currently runs an internet blog entitled FullyChristian.Com, where he engages in Catholic apologetics and random musings. On August 28, 2013, Shane Schaetzel was invited to appear on ChurchMilitant.TV for an interview about Catholicism for Protestants. The interview was broadcast over the Internet live and can be replayed here. Michael Voris is a veteran journalist from CBS News and now works as the senior journalist, apologist and commentator for ChurchMilitant.TV.